There's a big thing though in favor of the S3. The SGS3 in the Exynos version has a Wolfson DAC - which basically means the best audio output on a mobile device possible. The SGS4's most popular version (the Snapdragon one) has an inferior Qualcomm DAC. That's a major difference in audio quality. There's no comparison between the two in this article. Other than that I disagree with just one thing - the last sentence - that the S4 is surely worth the price premium if you're hesitating which one to buy. I was hesitating, and went for the SGS3. 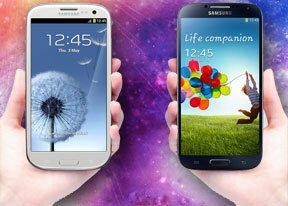 If you live in Europe, the price of the SGS3 is actually ~50% of the price of the SGS4. To put it in a perspective - about 300$ difference. Is the S4 really worth it? Personally, I don't think so. You can do the same with both phones, both phones are butter smooth and will be supported by Samsung for at least 2 more years. The Sgs3 is still a very good phone that isn't left behind modern high ends, while it costs half of it. That's why I disagree with the last sentence. I will not by a phone without FM radio. IP radio is not a solution, data contracts are limited in spain, and FM radio does not drain battery. Also i make sports or walk with my dog, i dont want to carry more gadgets that my mobile phone and my earphones. Still loving my Galaxy I9103, best screen (no amoled) and best Audio. I just love all these new Samsung mobiles. It is a great credit to Samsung and it means people like me that cannot afford a top end mobile have only to wait for the previous model to hit the second hand market for nearly half the original cost when it came out say only 12 month earlier. Cool stuff. yan, 16 Apr 2013fm radio is actually old news. do you really need it.? you can listen to fm radio on your car,... moreDo u think all people think like you? Dot u think people have an ipod n mobile at the same time? Nop nt everyone is you so respect others opinion. "Life Companion" compare with "Designed for Humans (Inspired by Nature)"
seriously the only edge of s4 to s3 are just additional features. i cant even say that they are essential anymore. aside from cameras and processor. In my opinion I think only those with an SII or SI should upgrade. If you have an SIII or Note II keep it. I don't think it takes a genious to realise everyone would accept an upgrade to an SG4, IF samsung offered its SG3 customers the chance to have it for free. Nonetheless, the lack of an FM Radio is an undeniable disadvantage, particularly in European countries, where data plans are few, strictly limited and expensive. It's stupid to deny the fact: Having an FM Radio on your phone doesn't force you to use it, if you don't need or want to. But it sure is an advantage everytime you feel (or need) to use it! Samsung have been stingy and just because you like the phone, it doesn't mean it's faultless, perfect, or that you can't critise it. How ridiculously fanboy can you get??? this is something that i don't even have to think about samsung galaxy s4 bits s3 by majority. the fact that it doesn't have a fm radio, i don't see s3 taking an advantage with that. i now own samsung galaxy s4 and i gave my s3 to my 76year old granny. well she will be interested in a fm radio. FM radio it's a need in country's were connectivity isn't working perfectly yet. Trying to decide which to buy new (not upgrade, do not have a galaxy iii now). I know you conclude that that is a no brainer to go with the new one, but if could get the S3 for almost half of the S4's price ($399 vs s4@$699 plus 13% tax), which would you go for? ynah, 20 Apr 2013i am an old xperia owner and i've been using it for 2 years now...i need to upgrade it and i a... moreTotally worth it. Not a big difference in s3 and s4 .